Pacquiao: "I'm waiting for who will challenge me"
By Mike Smith: Manny Pacquiao (61-7-2, 39 KOs) is looking for bigger challenges for his next fight after beating former four division world champion Adrien Broner (33-4-1, 24 KOs) by an impressive 12 round unanimous decision last Saturday at the MGM Grand in Las Vegas, Nevada. Pacquiao, 40, says he’s going to talk to Premier Boxing Champions boss Al Haymon to discuss who his next opponent will be. Although Pacquiao would like to fight Floyd Mayweather Jr. in a rematch, it doesn’t appear that fight is possible. Pacquiao needs better opposition than what he’s been facing lately in Broner and Lucas Matthysse. Neither of those guys were competitive with him. 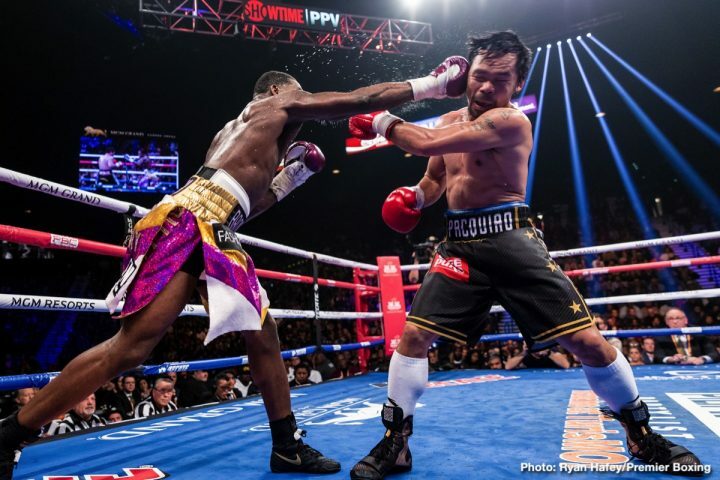 Former eight division world champion Pacquiao (61-7-2, 39 KOs) showed against the 29-year-old Broner that he’s still got more than enough left in the tank to dominate at the top of the sport. For the boxing fans that had doubts whether the 40-year-old Pacquiao was still youthful enough to beat one of the better fighters in the 147 lb weight class, they got a real eye opener in watching him take care of former four division world champion Broner in beating him by the scores 117-111, 116-112 and 116-112 on SHOWTIME PPV at the MGM Grand in Las Vegas, Nevada. The win for Pacquiao is just the start. He’s been cut off from fighting good opposition since his loss to Floyd Mayweather Jr. in 2015. Top Rank had Pacquiao spinning his wheels in the last two years he was with him by matching him softly against a shot Tim Bradley, Jessie Vargas before putting him in with Jeff Horn in a fight where he was mugged in Brisbane, Australia. Pacquiao is finally facing good opposition once again, and his career is looking very brought. It’s too bad Pacquiao wasted 2016 and 2017 by not being put in with good opposition. Ellerbe had been saying that Broner had a great chance of beating Pacquiao. That didn’t turn out to be the case. If Ellerbe wants Broner to start winning again, he’s going to need to aim lower in putting him back in with the likes of Ashley Theophane, because right now things are looking bleak for Adrien. He’s not talking the ‘R’ word yet in terms of retirement, but if Broner keeps losing and getting controversial draws like he’s been doing, his career is going to go belly up, whether he wants to admit it or not. Right now, Broner appears to be in denial about how bad things are with his once promising career. Broner went on a major rant after his fight with Pacquiao last Saturday night while being interviewed by SHOWTIME’s Jim Gray. Broner seemed to disconnected with reality that it was actually sad to see how lost he was. If you remember Broner when he was in the height of his career back in 2012, it was sorrowful to see how deteriorated he was last night against Pacquiao. The once proud, trash-talking Broner was reduced to arguing with Jim Gray when being asked simple questions after the fight.